Louisville Metro Department of Economic Development in partnership with University of Louisville Center for Environmental Policy and Management (CEPM) and an urban planning and environmental consultant team lead by Lord Aeck Sargent worked with community members and stakeholders to create a brownfields area-wide plan and implementation strategy for the Germantown/Shelby Park Rail Corridor. This project was funded through Louisville Metro Department of Economic Development by a grant from the U.S. EPA Brownfields Area-Wide Planning Program. 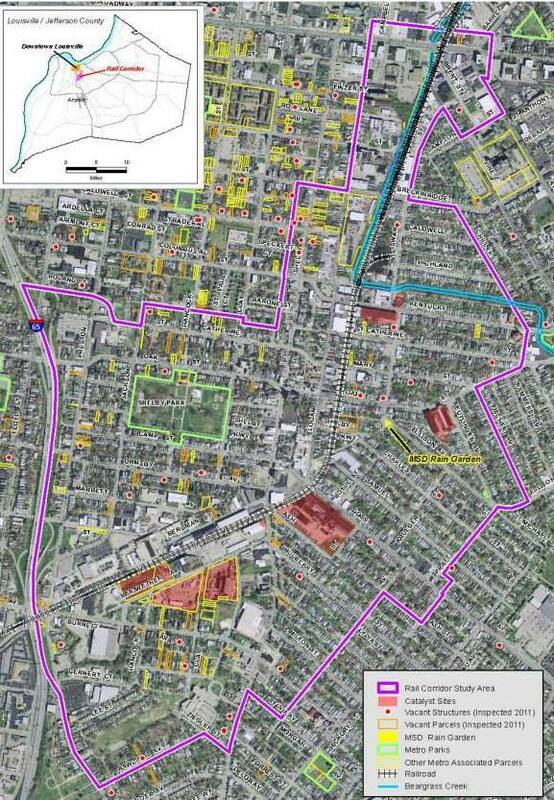 The final plan LOUISVILLE CENTRAL RAIL CORRIDOR Area-Wide Brownfield Plan, Louisville, KY; September, 2015, can be downloaded here. If you would like a printed copy of the report please contact us. This page houses resources for community members and organizations as well as archives the public meetings and events announcements related to the process. Please visit our Facebook page that serves as an additional on-going source of information and site for community input. Community Meeting: How Clean is Clean? What is the EPA Brownfields Area-Wide Planning Program? What will this Area-Wide Plan include? What are the boundaries of the Germantown/Shelby Park Rail Corridor Study Area? What are the five catalyst sites selected as focal points in this project?